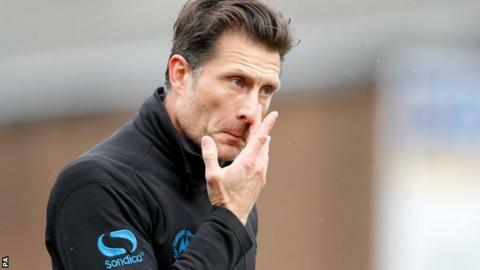 Torquay United manager Chris Hargreaves says it is "not vital" that the club find a replacement for Paul Sturrock. "It's not absolutely vital," Hargreaves told BBC Radio Devon. "In some situations, it helps with that relationship between upstairs to look at how we can get better as a club." Torquay are 17th in the Conference having won just one of their last 11 games in all competitions and cannot either be relegated or make the play-offs. Despite that, Hargreaves says he will not be making wholesale changes to his side as he looks for a more successful campaign next season. "There aren't a multitude of options, but I will be integrating a couple of lads into the squad and hopefully having a look at a few of the players," said Hargreaves, who have a debut to teenage goalkeeper Dan Lavercombe in the 2-0 loss at Aldershot on Easter Monday. "It's disrespectful to the other teams to be playing not weakened sides, but tampering with it too much. "Whatever I do, it's got to be for the football club, whether it's looking at players to see if they've got a future for next year or whether it's deciding about a certain few individuals."